Upon hearing the news that Big Order, the newest manga by Future Diary’s Sakae Esuno, is getting a short anime adaption next month, I re-read the whole manga. But when that wasn’t enough to satiate me, I had no choice but to pick up the author’s premier work: surreal detective story Hanako and the Terror of Allegory. In the world of Hanako and the Terror of Allegory, if someone believes in a folktale or urban legend enough, he or she can unwittingly be drawn into the story—set to become the victim of the tale. Yet, with the police powerless at best and unbelieving at worst, most poor souls turn to the net. It is then that they learn of Daisuke Aso: The Folklore Detective. Daisuke would much rather deal with normal, mundane detective work. But thanks to his unique circumstances he gets caught up in case after case involving these urban legends become real—or “allegories” as Daisuke calls them. You see, Daisuke has spent his life perpetually haunted by two allegories. The first is a severe case of hiccups that start up whenever an allegory is near; if he hiccups 100 times in a row, he will die. The second is his roommate and best friend: Hanako of the Toilet (a Japanese folktale similar to the Bloody Mary urban legend in the West). With his hiccups to act as a supernatural litmus test and Hanako to provide backup, Daisuke reluctantly helps those whose lives are at risk because of these supernatural stories gone wild. Soon, their group is joined by Kanae, a young college-aged girl, who begins working at the detective agency to repay the pair for freeing her from her own allegory troubles. Hanako and the Terror of Allegory is a four-volume collection of short stories about Daisuke and company, with each case taking up one to three chapters. Each case is set around a different Japanese urban legend or folktale. These range from the “the serial killer under the bed” to the Kokkuri (the Japanese equivalent of the Ouija Board). So if you’re interested in modern day Japanese horror tales, this manga is a great little introduction. Of course, along the way, Daisuke’s own legend grows as he becomes the center of the newest iteration of the urban legend: the internet-spread Creepypastas. As the tales told by his past clients spread and grow online, Daisuke becomes seen as a supernatural figure in his own right. He is the unstoppable Folklore Detective—a man able to defeat any horror. Because so many people believe in his legend, it starts to become true, with Daisuke having almost superhuman strength and speed—not to mention a healing factor on par with Wolverine. But there is, of course, the downside to this: If Daisuke relies too much on his urban legend, he will become transformed by it—and we all know that few urban legends have anything even remotely resembling a happy ending. This is where Kanae comes into play. Kanae is a normal girl—despite her brief stint haunted by an allegory. She quickly becomes the one thing that Hanako cannot be: Daisuke’s anchor to the real world. But as they go on dangerous adventure after dangerous adventure and Daisuke comes to care more and more for Kanae, he is faced with a quandary: How can he drag someone normal into the world of allegories? While his status as the Folklore Detective provides him a large measure of protection—even as it is a double-edged sword—Kanae is incredibly vulnerable to the supernatural horrors they face. It is a question with no easy answer. The climax of the manga brings together the main theme of the whole tale: Hanako and the Terror of Allegory is a story about the nature of stories. It raises questions about what it means to be an author and what it means to be a reader. Who does the story belong to and who gets to decide the meaning? In other words, the ending is more than a bit metaphysical—as anyone who’s seen/read Future Diary might guess—but it is ultimately satisfying. 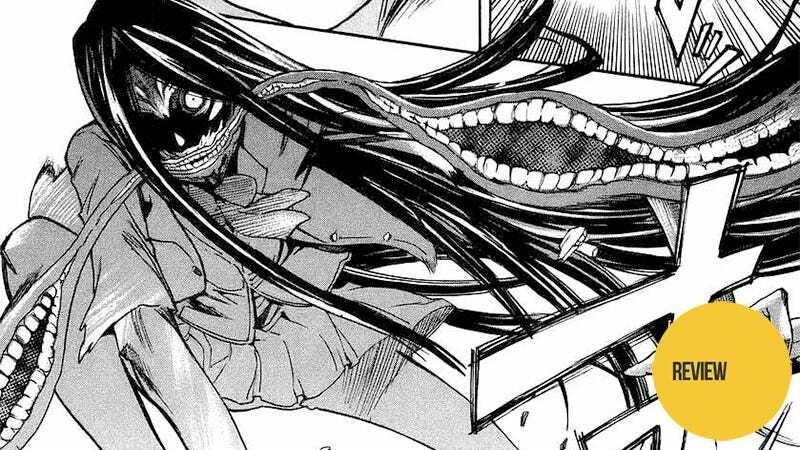 Hanako and the Terror of Allegory is a manga that gets a lot of mileage out of its premise. It goes from horror to action to comedy to romance and back again. Through each case you learn about a different Japanese urban legend and get hints about the deeper motivations and personal histories of each of the three main characters. It’s great fun. Don’t be surprised, though, if you have a nightmare or two after reading this—some of these tales are more than a little creepy. Hanako and the Terror of Allegory was released in Japan from 2004 to 2005. It was released in the US in 2010.